Success in business requires repeat customers. Repeat business require customer satisfaction. For vehicle wrap installers, customer satisfaction depends on how the wrap looks a few weeks or months after installation. Unfortunately, that depends largely on how your customer takes care of the vehicle. So the success of your wrap business depends not only on creating and installing great-looking wraps, but on training customers on how to keep them looking great. If you’re selling paint replacement wraps, there’s an important factor you need to consider and communicate. A lot of the demand for color change skins is for textured or matte paint replacement wraps matte black, matte gray and brushed metal. Because of the way these films are made, they can be harder to clean and end up looking…dingy. This can impact customer satisfaction, repeat business and your bottom line. Here’s how to approach that problem proactively. The first question you may have is why. Why is matte vinyl harder to keep clean? It doesn’t mean to cause you trouble, it’s just made that way. Most cast and calendared films come through the oven or calendars with a smooth glossy side and a slightly textured side. In general use, the smooth glossy side is the face film and the textured side goes face-down. When a matte finish is desired, the manufacturer simply inverts the film and finishes it with textured side up. The minute texture is what breaks up the reflected light to reduce the gloss level of the film. One might think this wouldn’t be a problem with matte paint replacement wrap films like Avery Supreme Wrap Film and ORACAL 970RA because these products come with a factory clear coat. One would be wrong. The clear coat seals the face film, but doesn’t change its texture. So a clear-coated matte film will still have minute channels and pockets that, over time, can harbor dust and debris. Some newer color change films like ORACAL 975 take this a step further with brushed metallic or extreme textured effects that look and feel like carbon fiber, leather, or even reptilian scales. It’s a very cool effect, but it can be very hard to maintain.This is why customers who opt for a matte paint replacement wrap often complaint that it looks dingy or dirty shortly after installation. Surely there are some solutions that allow customers to have their cool custom look that stays looking new. Yes there are. According to Avery Graphics product specialist Molly Waters, there are three solutions. Well, two and a half. I: Proper Cleaning: Molly suggests instructing customers to clean matte wraps with soap and water, then immediately follow with a 50/50 mix of isopropyl alcohol and water. This is a more effective cleaning regimen that prevents buildup of dust and grime. II: Add a Sealant: Instead of using isopropyl alcohol to remove dust and grime, the other approach is to keep it from building up in the first place. For that, Molly suggests a pre-treatment that seals the film and keeps the grime out. CroftGate Products offers wrap treatments that include a wax specially formulated to repel dirt and pollen. They offer formulas for both gloss and matte-finish films. CroftGate’s Wrap Care JP formula is designed for use on gloss, matte, and textured films and is recommended by Speed Wrap guru, Justin Pate. Using it every two weeks keeps the wrap looking brand new. A 32oz spray bottle costs less than $30.00 so it’s something you could included in the price of the install and hand your customer before he or she drives off in their newly customized ride. III: Talk them out of matte white. Seriously, Molly advises against installing matte white wraps. “It’s the hardest to deal with”, she says. Depending on the brand of film you choose, your customer has over 100 other options. Any of them is easier than matte white to keep clean, so that should be an easy sale. Besides, who wants to spend over $2,000 to make their car look like a Kenmore appliance? 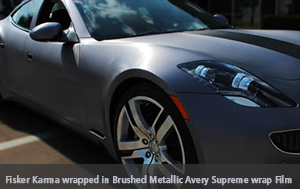 Vehicle Wraps: Cast or Calendered?